This little project combined two activities Emily has asked if we could do recently, but I had to give the “yes, we will do that later” answer. A good tip — Keep a list of requests your child makes to be done “later”. When boredom starts to creep in, break out the list! In this case, Emily had been asking if we could 1. Make hand warmers. and 2. Leave a surprise in the mailbox for our letter carrier. 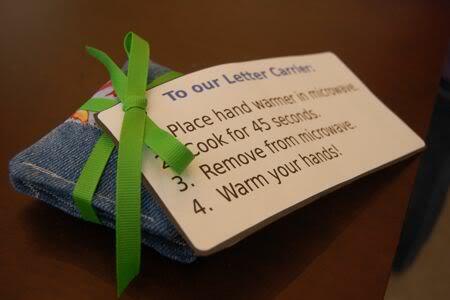 So today, we made hand warmers for our letter carrier! While working on this, it occurred to me that men are particularly hard to shop for, and even more difficult to craft for. I think they would be great for all the manly man things that men do (ie. shoveling the walk, taking out the garbage, going to football games, fishing, or hiking). Place in the microwave for 30-45 seconds, remove from microwave, and warm your hands! They also double as cold packs for bumps and bruises if kept in the freezer. 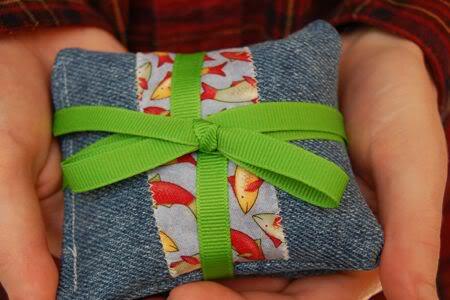 If you don’t have the time to sew, there are a couple of these available in our new Etsy shop! 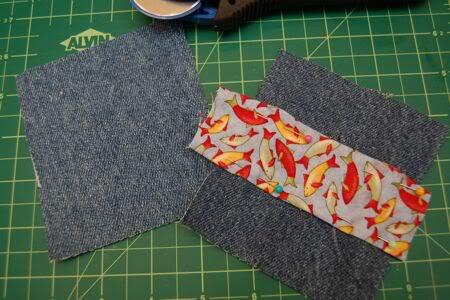 To make your own macho manly man pocket hand warmers for men, cut two pieces of generously sized 4 x 4 1/2 inches of denim. We recycled a pair of mens jeans for this! 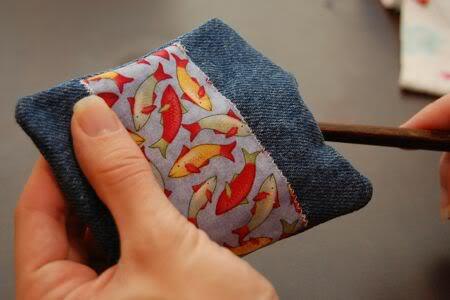 I used manly fish-print fabric for one side. 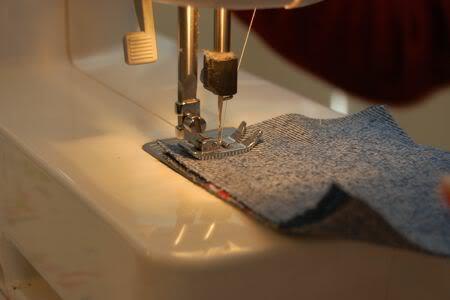 Fold the top and bottom sides of the fabric and pin into place. 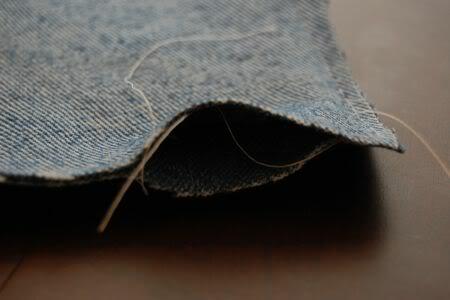 Zig-zag stitch along the fabric. 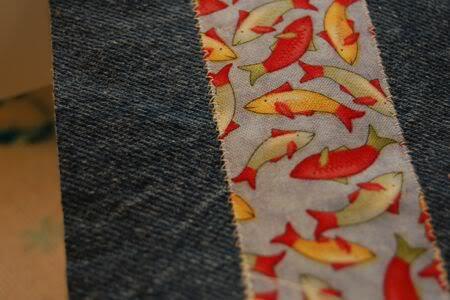 With right sides of denim together, stitch three sides closed. Be sure to leave an opening for turning and filling with rice! Leave an opening, as shown. 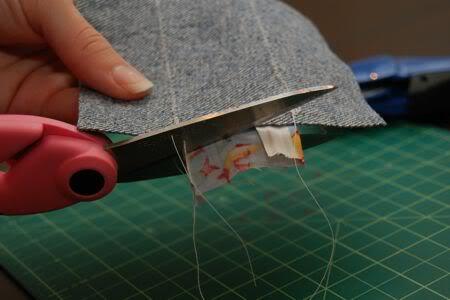 Flip right-side out, and gently poke corners out with a chopstick or knitting needle. Fill with rice! We couldn’t find a funnel, so Mark made another paper cup and we cut off one of the bottom corners. …and give to someone special! For other projects we’ve done with old jeans, you can check out these baby bibs, lunch sacks, or this no-sew wall organizer. You neglected to mention that if women use these manly hand warmers that there are no undesirable consequences such as chest and facial hair… OR ARE THERE? These are welcome in our house to counter-balance the typical estrogen bath we have going on here. What a fun gift idea for a mail carrier! @ Mark — I'm not sure how I'm going to get that testosterone smell out of my sewing machine. Any ideas? @ Maryanne & Jessica — Thanks! I'm planning to make a couple more of these, as well as some "girly" versions… maybe with some dried lavender inside. Wouldn't that be lovely? nice idea for a handwarmer! I love it. What a great idea for teachers as well. What a nice way to warm up after a cold recess outside. You have such a sweet girl. I love that she wanted to make something for the mail carrier. And this is a super cute idea — going to have to give it a try (now that I can sew and all :-)). I love this idea. My husband is in constructions, so he could definitely use some of these. What a neat idea! I love that you made these for the mail carrier. That is so sweet. I bet he was thrilled. How cute/adorable and manly. 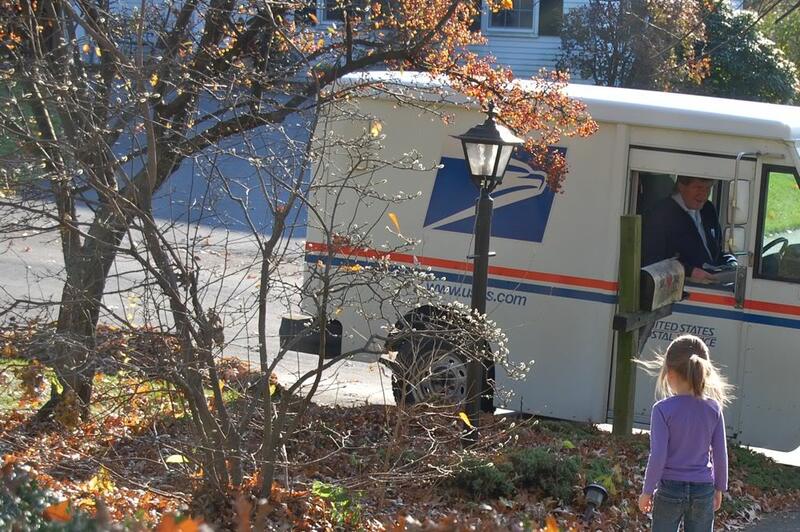 I love the pic of your sweet big girl standing there with the mailman. What did he say? BTW: How long do they stay warmed? @ Petula — They stay warm for quite a long time. I was skeptical at first, but they really work well! very cool idea! Love the fact that it uses rice which pretty much everyone will have in their cupboard! Bet your postie loved it. How thoughtful. rice? oooo I love it! I guess I will try a "she" version. Thank you. Congratulations on your new Etsy shop, how exciting! 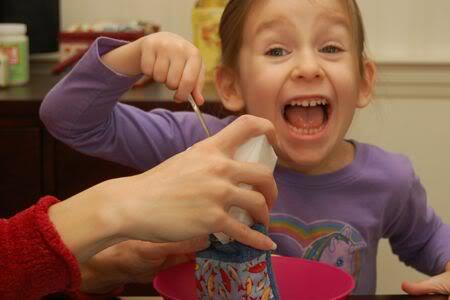 What a great idea, you are always coming up with great new crafts to try! This is such a fun idea, I love it! What a lucky mail carrier you have. =) Thanks so much for the great, giftable idea, I'll be linking. @ Rachel — Oh, thanks so much for the link! It is really appreciated! Valerie, I can't believe what amazing projects you have been up to since my sick leave! Very cool! even make really good bed-warmers in the Wintertime! ones like you suggested and see how they turn out!